Picture breathtaking views of the forest, complete with blue skies, clouds, and tree tops seen in the distance. The mist of the dew hangs in the air. It’s visually appealing, and a pretty accurate representation of the real thing. However, it’s a picture of a miniature landscape, built by Matthew Albanese, an artist whose photograph was recently featured in a New York Times article about creative, mini-landscapes. Albanese’s art creates buzz, and a 2013 Dailymail.com article also showcases his work, paying him significant compliments. The article features the incredible artistry of miniature landscapes made of jelly beans, walnuts, and chocolate. The spectacular designs were miniature tropical landscapes. According to the article, Albanese spent 700 hours on each faux landscape, creating deceptively natural-looking art, such as a desert and a brook. The artist uses dye-dipped cotton for grass and caramelized sugar for oceans, Albanese has made a willow tree from ostrich feathers. In one creative work, he etched lighting bolts into a black, plexiglass sheet to create an inspiring visual. As Michael Tortorella noted in his New York Times article, artists use a wide variety material to create the natural elements that make up a miniature landscape, such as clay, wax, glass, copper, and even fake crocodile skin to make extraordinary landscapes out of everyday materials. It takes ingenuity to make a fake twig look as if it has just fallen from an actual tree. Born in 1983, Albanese loved miniatures even as a young child, creating scenarios with his action figures. After graduating with a Master of Fine Arts degree from the State University of New York, he began working as a photographer. In 2008, a spilled canister of paprika inspired Albanese to create a miniature Mars landscape. 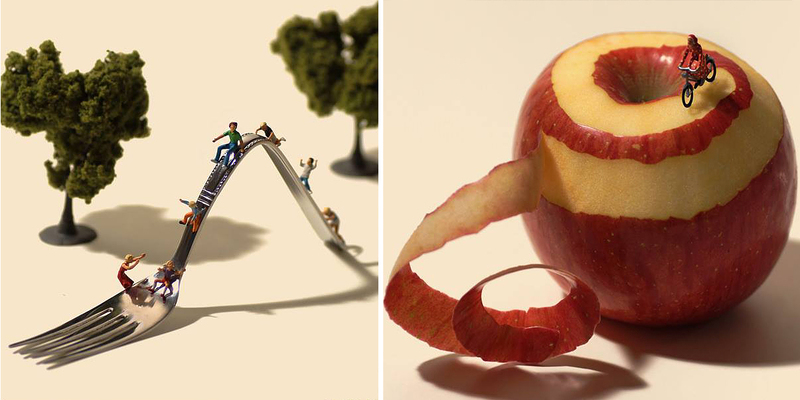 He continues to use food and other elements to create mini-dioramas. His work has been at the Virginia Museum of Contemporary Art, Mumba, Tourcoing, France, and the Winkleman Gallery.